Dennis Lee of Astoria Coffee, who will be opening up a coffee shop at 30th Street and 30th Avenue this summer. ASTORIA — An Astoria couple who made a local name for themselves by launching a coffee bean delivery service last year will soon open a brick-and-mortar shop. Dennis Lee and Liz Wick of Astoria Coffee announced this week that they've secured a space for their future coffee shop at 30-04 30th St., just off 30th Avenue, the blog We Heart Astoria first reported. "The shop has always been the main thing, so it's great to finally find a spot," Lee said. 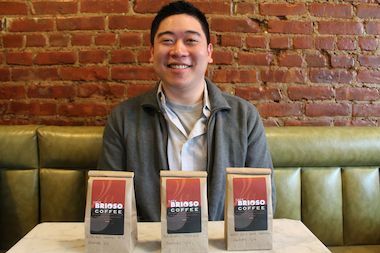 Astoria Coffee began last year when the couple started dropping off free samples of coffee beans — which hail from an artisan roaster called Brioso Coffee in their native Ohio — to residents in neighborhood. The operation which grew into a full-fledged subscription-based delivery service, and they also supply beans wholesale to offices and local restaurants like Snowdonia pub. But the plan had always been to open their own coffee shop, though Lee said the last year has given them a chance to get to know their future customers. "It's been great to have some time to build our wholesale and our brand a little," he said. The coffee shop, to be called Astoria Coffee, will serve such things as sandwiches, baked goods, loose-leaf teas and rotating menu of coffees from different roasters, Lee said. They are hoping to have the space ready to open sometime in June.